The first drift dive I ever did was at Heron Island (60th dive). This was from Tenements 2 to Tenements 1 on my first trip with the Byron Bay Dive Centre (I think that is what they were called back in those days - June 1989). Most of the dive sites at Heron Island are located on the eastern side of the fringing reef that surrounds Heron. Tenements 1 and 2 are sites located towards the southern end of the eastern reef. At the time it was the most remote of the Heron Island dive sites done using the normal dive boats (in 2008 I note that they have sites past this). On my trip there in June 1989 and later in October 1989 for the Heron Island Dive Festival, I dived these sites five times, although only two were this exact dive (the others were Coral Cascades to Tenements 1). 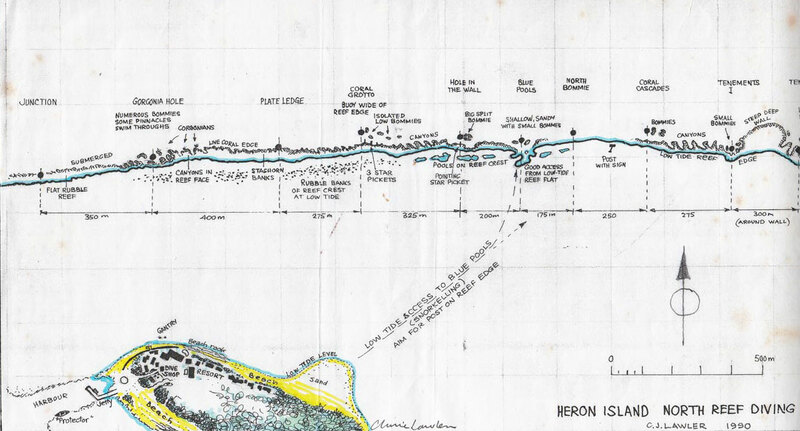 Most of the dives at Heron Island are (used to be?) drift dives. Basically you start at one mooring and the boat moves to another one (sometimes two or more sites along) and ties up to that mooring. You drift along in the tidal current and when you pass each mooring you check to see whether the boat is there. If not, you keep going till you reach the correct one. Tenements 2 is located further south than Tenements 1 and there is a mooring just off the reef. The bottom of the reef wall is about nine metres and there is a sandy slope to 18 and then 20 metres. Once at the bottom of the mooring, you head north-west along the bottom off the wall. You should drop to the 20 metre level and here you will almost certainly see some sharks (white-tipped) and turtles. There are also lots of long-finned bannerfish, batfish, coral trout, parrotfish and unicornfish along the way. From memory, the wall has some nice seawhips and smallish gorgonias. The fringing reef wall has a few small indents in it and these can be home to turtles as well as prolific numbers of smaller fish like fusiliers. Off the wall there are three small bommies, almost evenly spaced along the drift. Tenements 1 is located in a small bay and has a large bommie in the middle. There are some smaller coral bommies around it and on the north-western side a ridge comes out from the main reef. The mooring is on the top of the bommie. When you get to this spot, it is worth spend time around the bottom of the larger bommie as well as the smaller bommies. There is a swim-though under the ridge and this is worth examining. You may find crayfish and firefish living in it. As this dive is a bit deeper than the other sites around here, you will probably only get 50 minutes or so bottom time. Back in 1989 they only used 8.6 litre aluminium tanks - no other choice - so even the best on their air consumption would get no more than 50 minutes then. One of my favourite dives at Heron Island.